This class includes all the primary fundamentals of oil heat training for technicians in a three-day training program. Technicians who have experience servicing HVAC equipment, but have limited background working on oil equipment, are ideal candidates for this class. 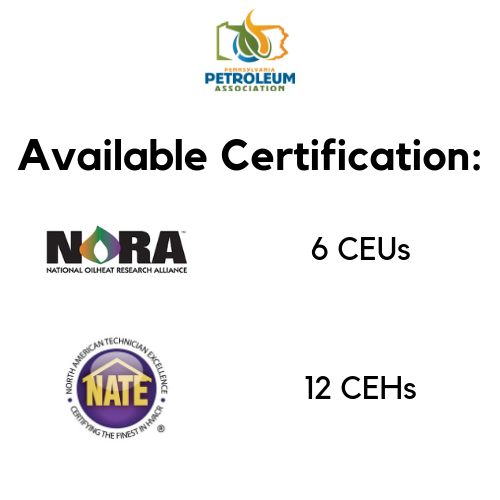 This training also serves as a great resource for oil heat technicians who completed the NORA Bronze Two Week Basic Oil Heat Program in the past, but could use a refresher training. Alan Mercurio has over 27 years of industry experience in various roles including service technician, equipment sales, and service manager. Today he is an industry author, consultant, educator, trainer and proctor. He holds certificates as a Master Technician in the State of Pennsylvania, Silver certificate from the PPA, NORA Gold Certified and is EPA Certified by the VGI Training center, as a type I and type II Air Conditioning Technician. He’s the past president and founder of the Susquehanna Valley Chapter of OESP (Formerly NAOHSM) and is on OESP’S Education committee and a sub-committee for NORA. Receive discounted rates at the Holiday Inn Harrisburg East for a special rate of $83/night. Book online or make your reservation by contacting them at (717) 939-1600 and request the PA Petroleum Association room block. Receive discounted rates at the Red Lion Hotel for a special rate of $75/night. Book online or make your reservation by contacting them at (717) 939-7841 and request the PA Petroleum Association room block.